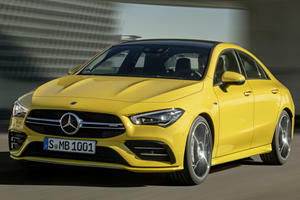 The 2018 AMG CLA45 4Matic offers 375 hp and 350 lb-ft from its 2.0-liter turbocharged engine, a 7-speed Dual clutch transmission and all-wheel drive are standard. Overall performance levels are superlative with even much larger sport sedans struggling to match its accelerative abilities. The tight cabin and hard ride may limit its appeal but luxury and safety levels are high with standard power front seats, drowsy driver monitor and LED headlights all standard fitment. A torque vectoring differential and available limited-slip differential add to its dynamic abilities. The compact sport sedan market is bursting with sharp driving performance machines intent on beating dedicated sports cars at their own game. The CLA45 4Matic is just such a machine, featuring one of the most powerful 4-cylinder engines in production it promises ballistic acceleration with seating for five. For 2018 changes are limited to a minor exterior and interior update as well as a new infotainment system. The CLA may be an entry level Mercedes but aside from one or two minor controls the interior features quality materials. The unadorned dashboard design is dominated by a large touchscreen and front seat occupants will have no trouble getting comfortable. This is sadly not the case for passengers attempting to contort themselves into the rear seats as the door opening and sharply sloping rear roofline makes for a frustrating experience all-round. Children and shorter adults may be happy on shorter journeys but the overall practicality of the CLA is severely restricted by the cramped rear seats. Cargo space is good however with a large trunk lid aiding loading of bulky items. The quick-shifting dual clutch transmission works well in most situations but it can be caught out at lower speeds, taking a bit too long to react to driver inputs. The CLA45 exhibits excellent body control and grip over twisty roads and the forceful power delivery makes for a very satisfying driving experience in these conditions. The front-biased all-wheel drive system does mean that the CLA pushes its nose wide when you start approaching the high grip limits but in most situations it feels natural and totally planted. That same tautness makes for a hard ride quality when you are not in the mood to set a new personal best time for the trip home and the jittery ride over uneven and bumpy surfaces can become tiring on longer trips. This sports sedan never lets you forget that it is a performance vehicle above all else and this is where some of its competitors offer a more rounded range of abilities. The AMG CLA45 is equipped with a turbocharged 2.0-liter four-cylinder engine which produces a massive 375 horsepower and 350 lb-ft of torque. This is channeled through a 7-speed dual clutch transmission to all four wheels. Acceleration is explosive from a standing start with 60 mph reached in a claimed 4.1-seconds. This best-in class performance is backed up by superb in-gear acceleration figures too and makes it a top choice for speed-hungry enthusiasts. 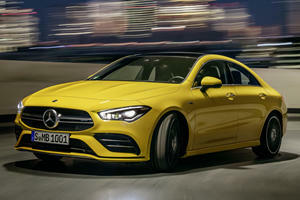 The Mercedes CLA45 4Matic sits at the top of the CLA food chain and comes equipped with a range of standard equipment. Notable items include an updated 8-inch touchscreen with Bluetooth integration, 14-way power front seats, LED exterior head and tail lamps, MB-Tex upholstery and ambient interior lighting. Standard safety systems include adaptive brakes, brake assist, keyless start, rain-sensing wipers as well as optional, lane keep and blind spot assist, adaptive cruise control and parking assist systems. There are also a wide range of packages and individual options to choose from. Two useful ones are the Smartphone Integration Package which adds Android Auto and Apple CarPlay while the Premium Package includes blind spot assist, keyless go, heated front seats and hands-free trunk access. 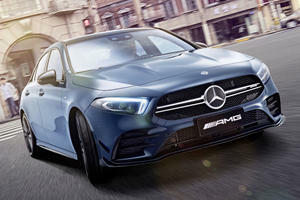 The one performance enthusiasts should consider is the AMG Dynamic Plus Package, this includes sport suspension, AMG limited-slip differential, raised top speed (to 167 mph) and an additional driver selectable race mode. 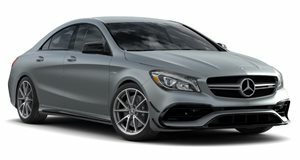 The Mercedes-Benz AMG CLA45 4Matic is a no-compromise focused sports car parading as a four-door sedan. It offers peerless acceleration and serious grip levels at the cost of cramped rear seats and a very sporty ride quality. This sport biased character will be the deciding factor for most shoppers and those seeking more practicality and daily-usability may need to look elsewhere.